Speaking at the Presidential Palace last month, President Joko “Jokowi” Widodo called for more people to use public transport and said he wanted to see better integration of its many modes in Greater Jakarta. Among the many public transportation systems in Greater Jakarta include the yet to be fully operational Mass Rapid Transit (MRT) and Light Rail Transit (LRT), Transjakarta buses, the airport train and commuter trains. However, their lack of integration means these transportation systems are not effectively utilised and indirectly contribute to Greater Jakarta’s annual loss of US$4.6 billion due to congestion. “We really need to push people to ride public transit modes that we have prepared so we can significantly reduce the number of cars on the streets. I expect we can manage all these modes better,” Jokowi said when referring to Greater Jakarta’s public transport modes. Jokowi also said Indonesia should improve its transit-oriented development management by taking into account town planning and urban transportation. Accordingly, Jakarta Transportation Agency head Sigit Widjatmiko promised that 2019 would be “transformational” and “the year of integration”. The Greater Jakarta Transportation Agency (BPTJ), meanwhile, said the start of the MRT, LRT and the electronic road pricing (ERP) system would see a “a giant leap” for people in the area. Both the MRT and LRT are to start operations this year. In 2018, Jakarta was ranked by traffic information and navigation service provider, TomTom as the third city in the world most affected by traffic congestion, after Mexico City and Bangkok. Jakarta has over 13 million motorcycles and 4.4 million cars on its roads. It is estimated that more than 2.1 million trips are made from the outskirts of Jakarta into the city daily. Only around 20 percent of these trips are made using public transportation due to inefficient and unintegrated services. 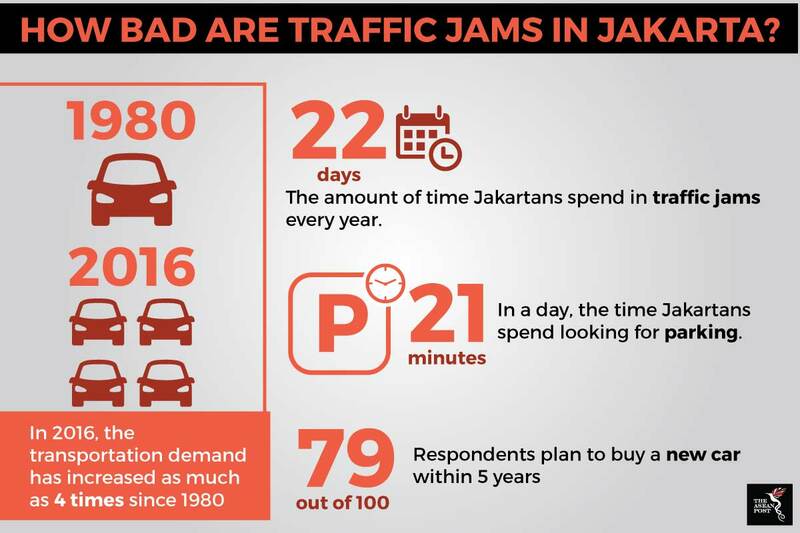 A study by Uber in collaboration with the Boston Consulting Group found that on average, Jakartans spend 22 days a year stuck in traffic compared to citizens of other major Asian cities who spend around 19 days on average. The city has tested a number of car limitation rulings to reduce traffic blockage on key roads during peak time, including a 3-in-1 policy that allows only cars with three or more passengers in. In May 2016, Jakarta introduced the odd-even policy, under which only cars with license plates that end with even numbers are allowed to enter the city through key thoroughfares on even numbered dates. The same ruling goes for odd numbered licence plates on odd numbered dates. In July 2018, drivers in Jakarta were subjected to an expansion of the road rationing ruling in a pilot testing by the Greater Jakarta Transportation Body (BPTJ) to further limit the number of cars entering the city. The expansion also included the extension of policy operating time from covering only rush hours to 15 workday hours from 6 a.m. to 9 p.m. At the time, the new expansion targeted congestion improvement for Jakarta’s traffic in preparation for the 2018 Asian Games and Asian Para Games. Businesses are also making changes to accommodate the odd-even license plate limitation ruling in Jakarta. GPS navigation software Waze introduced a feature that adapted it’s routing according to the last number in a car’s licence plate. The feature, only available in Jakarta and Brazil, enables users to get different directions depending on dates and their licence plate numbers. At the start of the official implementation, ride-hailing company Grab also launched a specially designed algorithm to filter and match odd-even license plates to the date, time and pick-up destination. Previously, when the odd-even policy was first introduced, Jakarta’s city-owned bus operator PT Transjakarta launched premium buses to cater to commuters who were used to driving their own cars to work every day. Based on data collected after the company’s trials, the odd-even policy has proven to have a positive impact on travel times within the capital. Field evaluation by the Jakarta Transportation Department found that vehicle travel time during the odd-even trials decreased by about 12.1 percent. For specific trips, trials carried out during the month of July revealed that vehicle travel time from Kebayoran Lama to Metro Pondok Indah which usually takes around 20 minutes, came down to 15 minutes. Vehicle travel time from Sudirman to Istana Merdeka, which usually takes 30 minutes decreased to 25 minutes. The odd-even policy also impacted vehicle average speed, increasing from 20.6 kilometres per hour (km/h) to 23.1 km/h. Similarly, air quality in Jakarta also improved. While other air quality parameters are still below the quality standard, pollutants from motor vehicles decreased during the odd-even trial. Air quality monitoring by the Jakarta Environment Department showed that carbon monoxide (CO) concentrations decreased by 1.7 percent while nitrogen monoxide (NO) concentrations decreased by 14.7 percent. Total hydrocarbon content (THC) also decreased by 1.4 percent. The introduction of the traffic ruling converted a number of commuters to public transportation users, and the operation of new LRT routes is also expected to increase public transportation use further. This article was first published by The ASEAN Post on 8 August 2018 and has been updated to reflect the latest data.